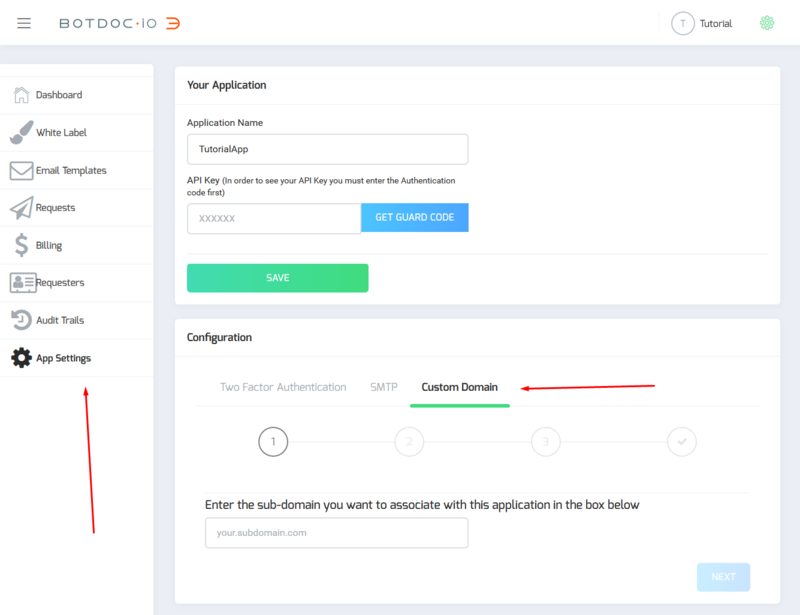 This tutorial is in order to use your own domain with Botdoc API. First, go to your App Settings then click on the Custom Domain tab. 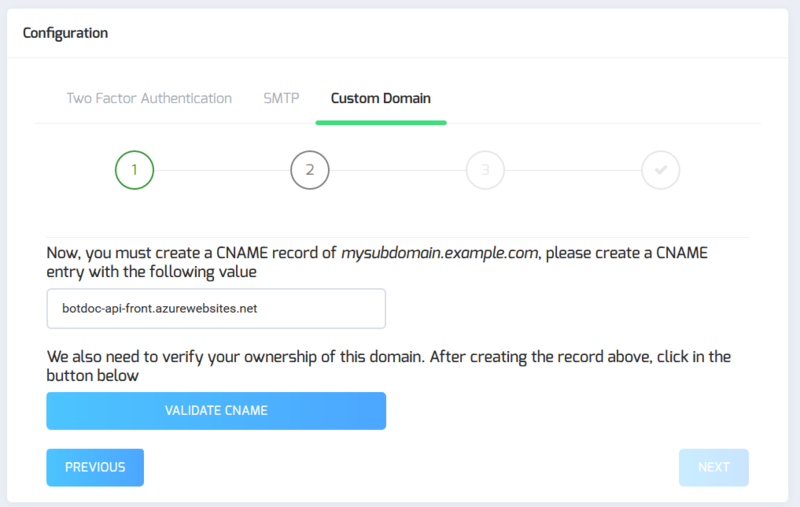 Now on the seconds step, create a CNAME record with a value of “botdoc-api-front.azurewebsites.net” for the LIVE environment or “botdoc-api-front-sandbox.azurewebsites.net” for the SANDBOX environment. As soon the CNAME propagates you can hit validate. Nameserver changes can typically take from a few minutes to 24 hours to take effect, however technically can take up to 24 hours to 48 hours for a DNS fully propagate globally regardless of whether it’s adding a new record or changing the value of an existing one. Once it is validated, you can click on the “next” button. 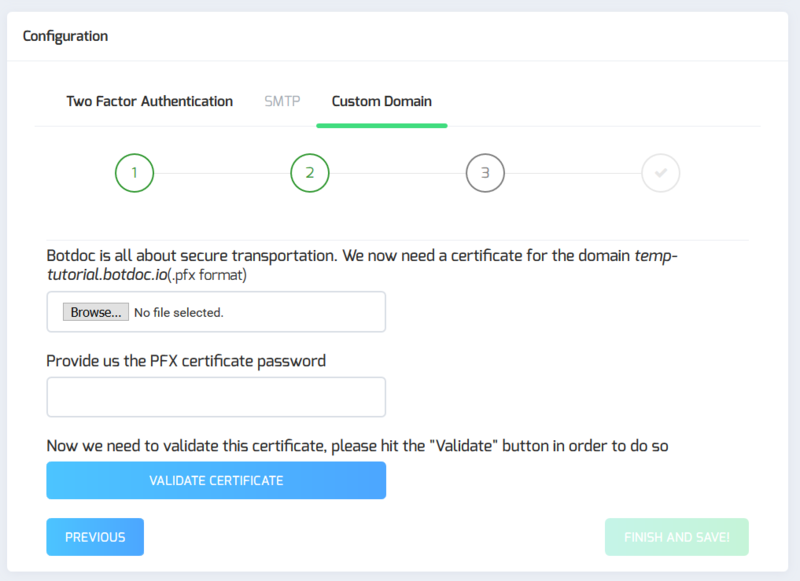 On the last step, you have to upload your certificate in the pfx format and the password. Since Botdoc is about secure transportation, you must have a SSL certificate. Once the certificate is validated, you can hit finish and save. Then you’re all set! You can start making your requests with your custom domain.